A few days ago, I realized that I only owned high-waist denim shorts. Denim shorts are great, and it’s possible to dress them up, but sometimes you just want something a little more put-together, you know? I headed into H&M, found a really cute pair of army green cargo shorts, and happily made my way to checkout. I love my new shorts, but I’ve been struggling to find new ways to wear them. So, this post is a little selfish of me. I want to find some good outfit ideas! Cargo shorts, whether they’re army green, khaki, navy blue, or some other color, can be worn in so many different ways. 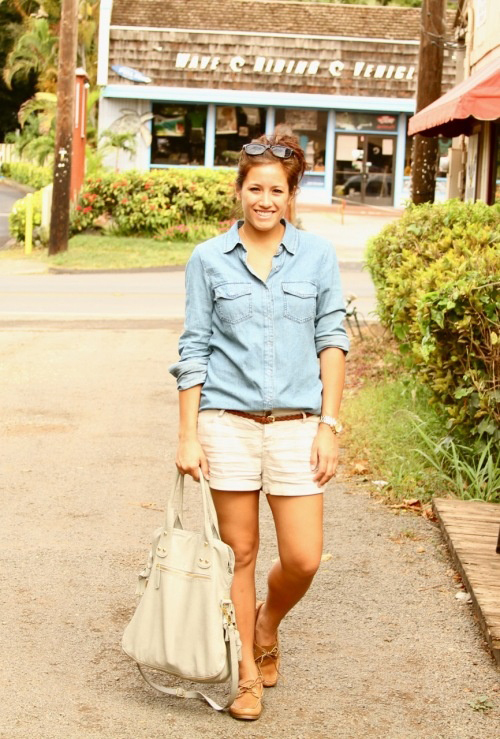 Here are 20 style tips on how to wear cargo shorts, with all sorts of outfit ideas. 1. You can’t go wrong when you pair green cargo shorts with a white tee and neutral accessories. It’s so summery and easy. 2. Add a long vest over a white tank and you’ve got yourself a boho outfit. 3. For chillier days, a bright cardigan over a white tee gives a nice punch of color to an otherwise pretty neutral-looking outfit. 4. Layering a black sweater over a striped shirt and green cargo shorts makes a great transitional outfit for fall. 5. Keep it simple by tucking in a plain tank and adding a belt and heels. 6. A white lace top is an easy way to make cargo shorts more feminine. 7. Go for a more casual vibe with a chambray shirt and pastel sneakers. 8. A striped shirt looks great with cargo shorts. Add a light scarf and a cardigan for layers. 9. Take this simple outfit into fall with flats and a denim jacket. 10. 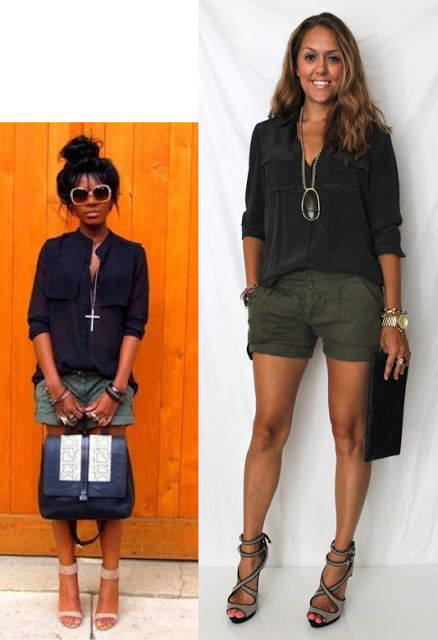 Add a white button-down shirt and a pair of heeled sandals to make army green cargo shorts more professional. 11. A white button-down looks just as good with khaki shorts. The colorful flats add a nice pop of something bright. 12. White and black aren’t the only color shirts you can wear with army green – bright coral looks great also. 13. Make the most of the summer heat and add a breezy white crop top and gold statement necklace. 14. Add a bright top and patterened heels for a really cute look that can go anywhere. 15. 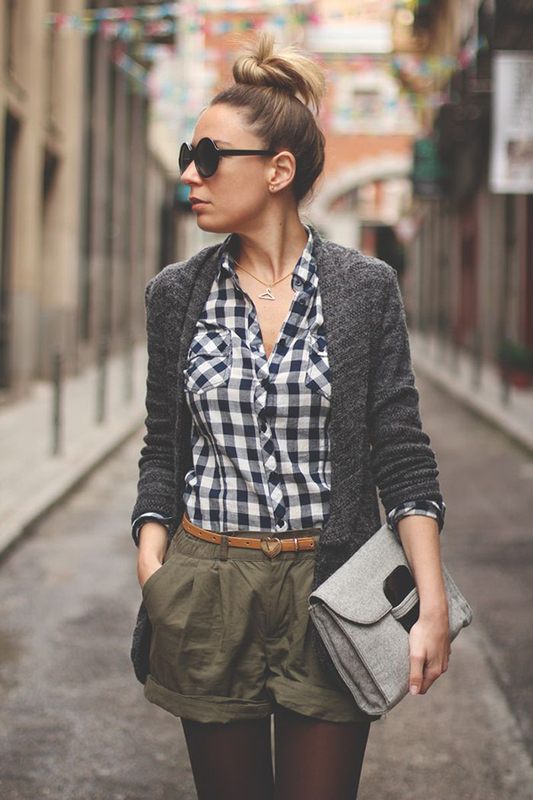 A polka-dot button down looks so cute with army green shorts. 16. Add a light chambray shirt and oxford shoes for a preppy outfit. 17. Thinking ahead for fall? Tights look cute under cargo shorts. Add a cardigan and you’re good to go! 18. You can’t go wrong with a silky black shirt and heels. 19. Add ankle booties and a cargo jacket for a comfy but chic outfit. 20. A plaid shirt looks so cute with cargo shorts. It’s more put-together than just a tee, but it’s still just as easy.